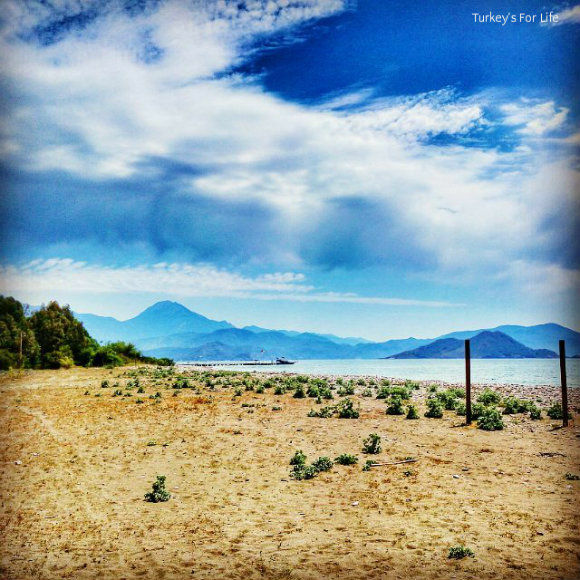 Welcome to our guide to Fethiye beaches. And to lots of other beaches and bays within easy reach of Fethiye. For many people who choose to spend their summer breaks in Turkey, beach holidays are perhaps what first spring to mind. When the weather in Fethiye is hot, everyone wants to hit the beach! The beaches around Fethiye – and in other areas, too – are not just sunbathing areas for us, though. We’re also suckers for the wild, lonely or dramatic stormy scenery of a beach in winter. These types of scenes, we often capture when we’re wandering or hiking around Fethiye in the cooler months. 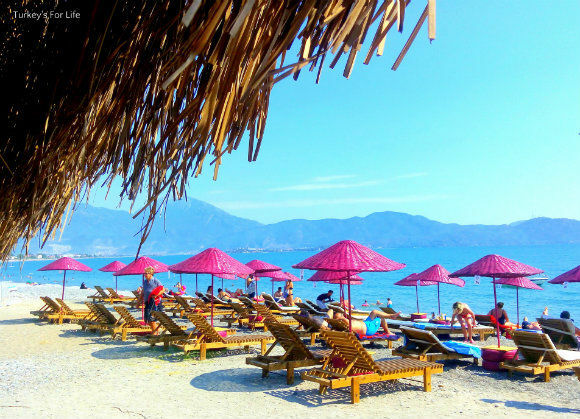 Anyway, however you like to soak up your beach life – sunshine, rain or storms – we thought we’d do this guide to Fethiye beaches. Bays and coves where you can kick back and relax. Some are well known, some not so well known. Some are easily accessible. Some you might need to get your hiking boots on or get yourself on a boat. Sand, pebble or rocky coves; Fethiye beaches are a real mix. We’ve even compiled this interactive map so you can find out where the Fethiye beaches and bays are. You can click the top left icon to slide the beach name tags in and out. If we’ve written an article about the beach, the link should be there for you to click. It’s fully interactive so you can zoom in and out and you can also click the top right icon to view the larger map. Let’s get started. As with our eating and drinking around Fethiye guide, you can click on the links below to read our articles on the beaches we’ve written about so far. Ahh, so much has changed around this peninsula in recent years. We walk around Yarımada in the cooler months and, in summer, there used to be quiet, relatively secluded, forest bays. Now it’s all about ‘beaches.’ Snack bars, restaurants, weekend music, weddings, imported sand. Don’t worry, though. These are still some of our favourite Fethiye beaches and they remain in our must sees and dos for this area. Perfect scenery, calm waters and you can still chill out, enjoying the beating noise of the cicadas in the pine trees on a quieter day. We’ll be updating our old blog post about Aksazlar, soon. Under new management and now called Leb-i Derya, this place has had a real facelift. Beds, umbrellas, imported white sand, restaurant, facilities for wheelchair users. The lot. Okay, it’s an all-inclusive hotel but, if you’re staying at Letoonia, you have a few private beach areas to enjoy. Some seasons you can pay to go in for the day, too, and enjoy a day of all-inclusive here. More sunbathing spots than there used to be but Küçük Samanlık is hanging on in there as one of the originals in keeping with that rustic feel. The big sister of Küçük Samanlık and just next door. Another bay that has had a tidy up in recent times. Kuleli Beach Club has a lake, barbecues, cabanas, beds, umbrellas, butcher (for your barbecue meat), restaurant, stage area. This is a real beach club with crystal clear water. Expect a DJ at weekends in high season. Very popular with Turkish tourists and locals. Beautifully shaped bay and once, sadly, piled with litter. Now known as JJ Beach Park. Snack bar facilities as well as beds and umbrellas and those all important köşks. A great swim spot. Ahh, beautiful Help Beach with its free shuttle boat service from Fethiye harbour. There’s that imported sand again. This place is not cheap but they have created something special here. 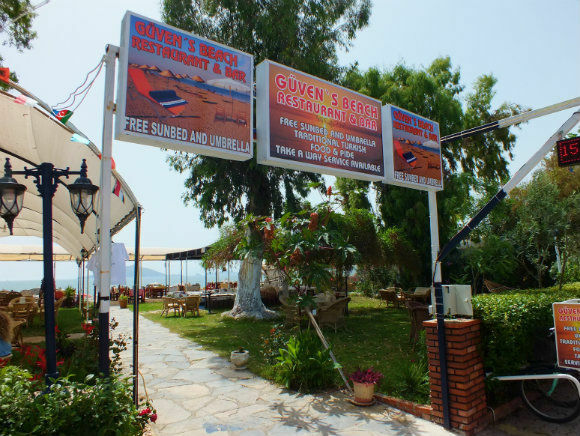 A perfect place to go for a treat and a great addition to the Fethiye beaches scene. Köşks amongst the forest trees as well as beds and umbrellas. No entry fee or parking fee. 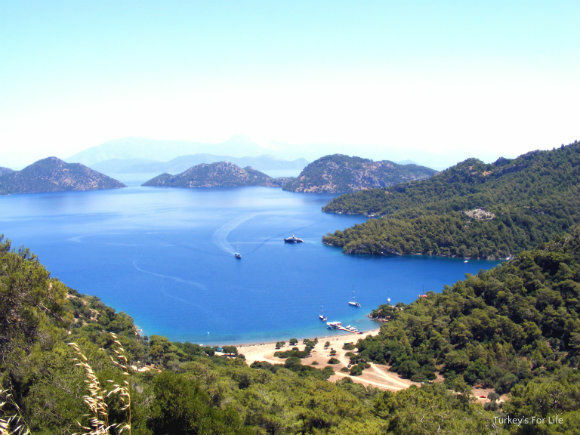 Many of the Fethiye bays are only reachable boat. The Blue Bays are those which follow the coastline from Help Beach. You can do a Blue Bays daily boat trip to take in some of these. 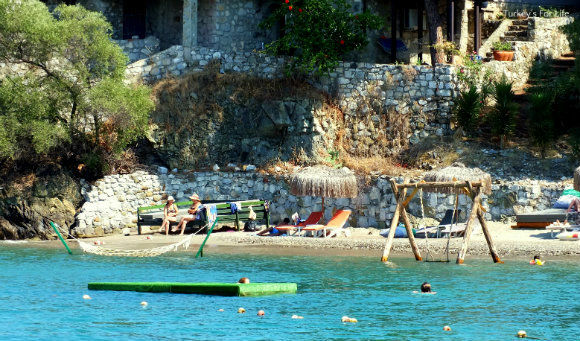 If you have your own boat transport, Turunç Pinarı has a beach and restaurant. Home to just a handful of homes and holiday accommodation, why not sample island life for a day? Fethiye beaches with a difference! Why not sail across from Çalış – just 5 minutes – and spend the day on an island beach at Şövalye Adası Restaurant & Beach. Complimentary boat service (hourly) takes you to the beach and restaurant. Loads of choice on the menu, too. Brand new business for 2018. If it’s cooling breezes you’re looking for in the summer heat, the beaches of Çalış are your place. Great, stormy scenes in winter, too. Right at the beginning of the Çalış Beach stretch. There’s a restaurant here, too. 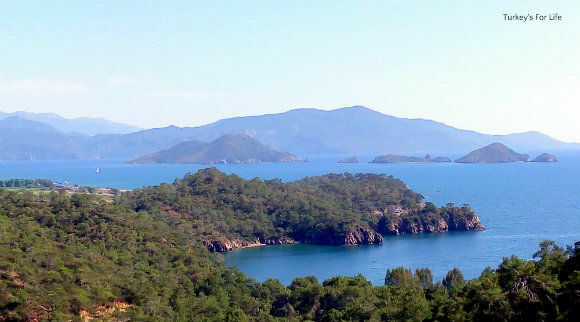 Çalış Beach is one of the public Fethiye beaches. This means you don’t need to pay any entry fee. Beds and umbrellas are available for a small fee and, despite the fact some people don’t use them, they should be used in high season. 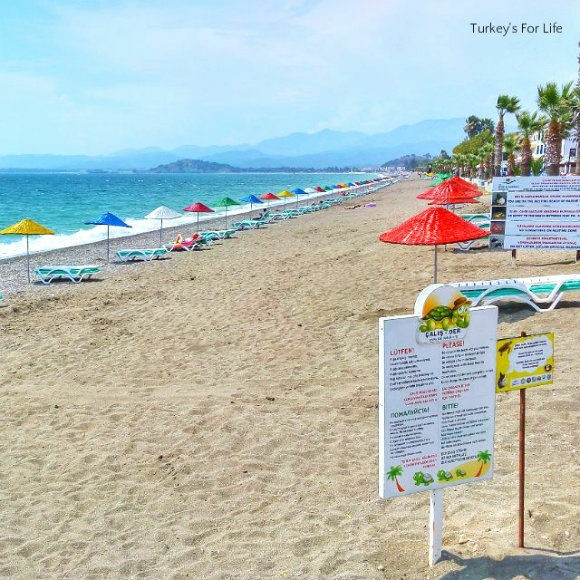 Some Fethiye beaches are nesting areas for sea turtles and Çalış Beach is one of the main places they use to lay their eggs. It’s important these eggs are not damaged by people lying on the sand or jabbing umbrellas into it. Plenty of bars and restaurants along Çalış Beach to keep you fed and watered. Shops, too, for buying your own provisions. Some bars, like Calisto, also sell ‘beach picnics.’ Don’t leave until you’ve witnessed the famous Çalış Beach sunset. 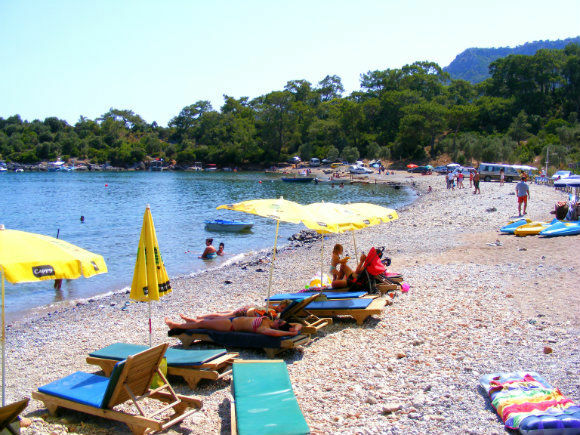 Still along Çalış Beach, Aroma Beach is one of the more popular Fethiye beaches. Free beds and umbrellas after a minimal spend of 10 TL per person. There’s a restaurant and bar and sometimes they also hold events and evening entertainment. One of the stalwarts of the Çalış set of Fethiye beaches. Carole and Güven serve drinks and food – including the favourite puffy lavaş bread and great pide – to sunbathing and dining customers. Kids club here, too, that holidaying kids are welcome to join in. We’ve not been here so won’t pretend to know any details. Meyhanes usually involve live fasil music in the evenings. Family run and popular amongst some of our friends. Everyone has their own favourites along this little stretch. So named because this used to be the last stop for the Çalış dolmuş. Currently being run by a young couple we know. Chilled out bar, snack bar and, as with the other beaches, free beds and umbrellas. Can recommend the homemade köfte and also the very reasonably priced menemen. Once a lonely stretch of pebbled coastline, this is now an establised part of the Fethiye beach scene as more villas and hotels are built in the area. 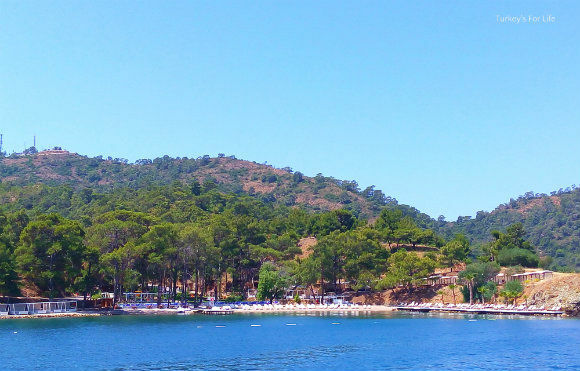 The public areas of Koca Çalış beach are one of the few places left in the Fethiye area where picnicking familes can just come along and set themselves up for the day. Some areas have now been sectioned off as private for use of villa and hotel guests but, for now, there is still a lot of open space. 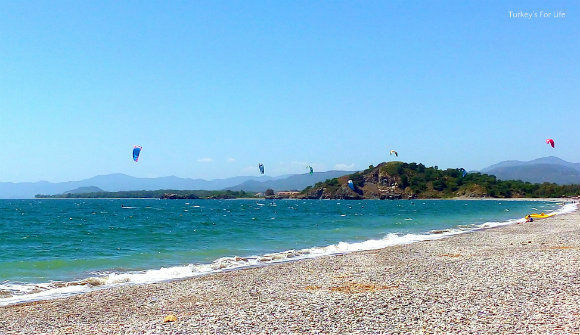 All of these Koca Çalış beach areas in Fethiye are great for watching the kitesurfers and windsurfers whizzing by. Snacks and drinks as well as sunbathing. Again, one of the old stalwarts and a great set up. You can come here for kitesurfing lessons and other watersport activities. Bar and restaurant as well as sunbathing. Bungalow accommodation, bar snacks and free sunbeds. Popular spot for weddings and other events as well as daily beach life. We love to come down here. Lovely food as well as sunbeds and umbrellas. Famous for their Turkish breakfast. Under another name (Birlik), this used to be one of the only restaurants around this area. Still going strong as Mekan. Although there is increased development around here, these Fethiye beaches are still have more wild and remote feel to them. Don’t expect too many crowds. A bay popular with barbecuing and picnicking families. Back in the day we used to go here for BBQs with Turkish friends almost every Sunday. There are no facilities at this particular Fethiye beach. Not too far from the all-inclusive Barut Sensatori hotel, if you venture this far, you will have Akmaz Beach practically to yourself. Deniz Incisi restaurant serves up decent Turkish food and is usually open all year. There are beds and umbrellas in summer, too. Proposed site of Fethiye’s new boatyard with local campaigners trying to keep the area protected. Karaot is a wild beach that, again, you will only share with one or two other people and migrating birds. Snack bar on the beach. 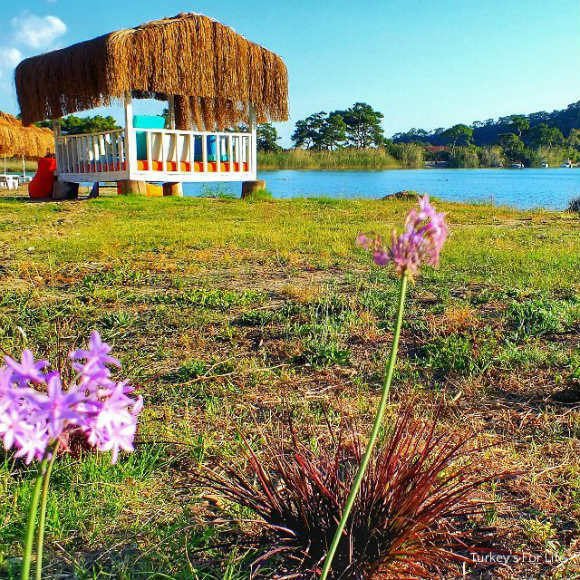 This is a beautiful stretch of Fethiye’s coastline with small eco friendly hotels such as Yonca Lodge sharing the space with all-inclusive set ups like Club Tuana. The bay that looks so beautiful from the D400 road, heading towards the small town of Göcek. A bay where campers descend. Lots of camping facilities here as well as beach bar/restaurant and beds and umbrellas. Entrance and parking fee applicable. So named for its protected Günlük (Liquid Ambar) trees. This is a protected nature area so you’ll pay an entrance fee for you and your vehicle. Calm waters. The beach is run by the Bay Beach Club hotel and you can have food and drinks there. 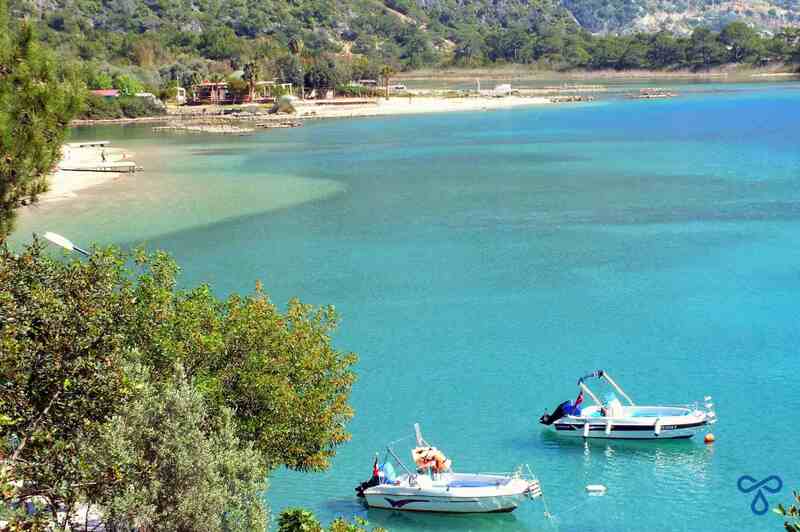 Still a Fethiye beach as Fethiye now stretches right along the coast and incorporates Göcek. Just before you hit Göcek, take a left at the signpost for Inlice public beach. Popular with locals in the summer months. 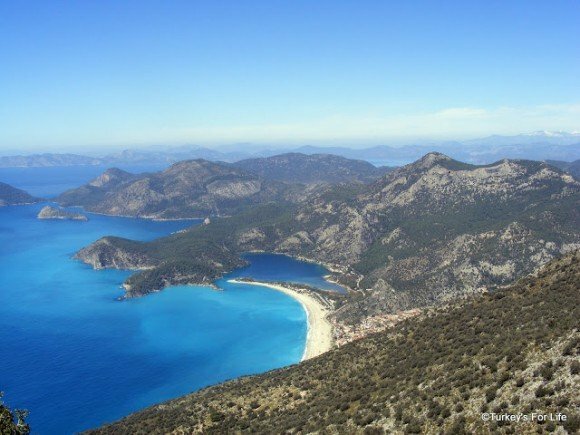 Ölüdeniz is most definitely considered to be one of the beach holiday resorts in Turkey. Not difficult to see why once you witness the stunning scenery around here. Lots of beaches to choose from around here. Okay, we’ll hold our hands up here. This is probably the most famous of the Fethiye beaches. The stretch of sand most people are talking about when they say they want to go to Ölüdeniz Beach. A long sandy nose that frames the lagoon and is the subject of so many tourism posters. Not being very beachy people (as you can probably tell from there being not too many links to articles), we went to Kumburnu (the main lagoon beach) in 1998 when we first came to Fethiye. We’ve never returned. You’ll pay an entrance fee as it’s a protected area and then for your beds and umbrellas, too. This is the beach we photograph from on high. A stroll along the back road of the lagoon will reveal lots of private Ölüdeniz beaches and you still get to swim in the calm waters. Pay for beds and umbrellas at these beaches. There are beach bars, restaurants and entertainment – especially in the evening. These beaches are popular wedding venues, too, and some have accommodation ranging from camping to boutique hotel standard. Snack bar, restaurant, caravans, boutique hotel, beds and umbrellas. Just about everything at S3 Sea Horse Beach Club. Sister restaurant, Denizatı is along the harbour in Fethiye. We’ve been here a couple of times but are yet to write about it. Very popular chill out beach and well established. Perhaps one of the most famous of the Fethiye beaches. We’ve only been here for a friend’s wedding but intend to return. We’re heading into a world of mountains and lush greenery from the lagoon. Real name, Belceğiz, this is the other Ölüdeniz Beach. Such a beautiful sight for taking photos, it’s the first beach you’ll see when you get off the dolmuş. 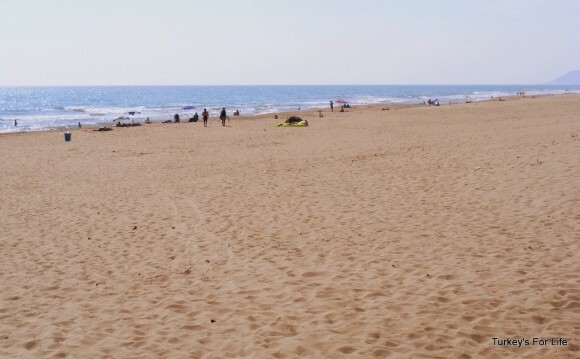 Belcekiz Beach is a public beach so entrance is free. We struggle with the heat in summer so it’s not worth us paying the fee for beds and umbrellas. Belceğiz is our cooler months beachy paradise. A great place to be when it’s the Ölüdeniz Air Games in October or on a winter Sunday afternoon. Sweeping sand and huge waves to play in. This is a protected area, and, because of its location, doesn’t get overcrowded. Entrance fee as it’s a protected zone. Snack bar facilities and beds and umbrellas. Accessible by taxi boat from Belceğiz and also day trip boats from Ölüdeniz. (It is possible to climb down from the Lycian Way but this is not recommended by us. Akut – mountain rescue – and the jandarma are kept busy enough rescuing people who get stuck here.) Camping and beach bars at Butterfly Valley. Climb down to here from Faralya. A rocky bay with beach bar, camping and bungalows. 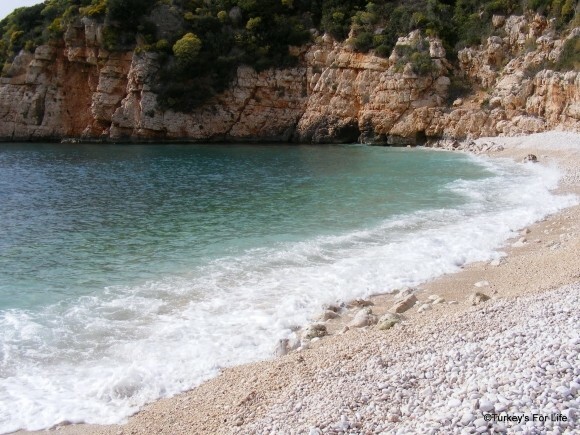 A hike from Kabak or take a speed boat. 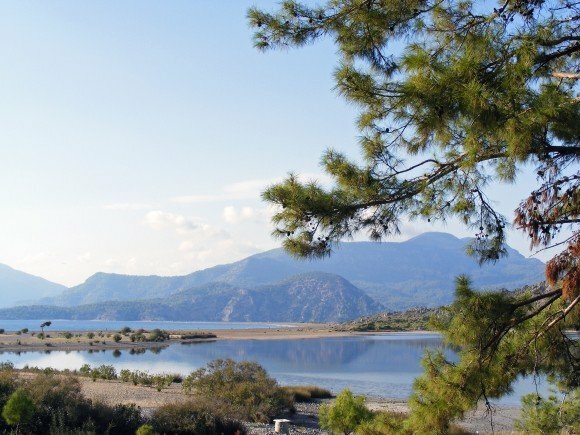 You’ll need your hiking boots for a couple of these Fethiye beaches and bays. Drive through Kayaköy and follow the signs to Gemiler. There’s an entrance fee for this beach. Snack bar facilities and beds and umbrellas. We haven’t been here for some time but the water is calm for swimming. Accessible by boat and a popular stop off on the daily boat trips from Ölüdeniz. Coldwater Springs / Coldwater Bay; call it what you will. Beautiful viewed from the Kayaköy to Ölüdeniz hike. You can hike down to the bay from Kayaköy, but you’ll need to come back up again. Again, Coldwater Bay is accessible by boat, too. Popular with the yacht crowd as it’s easily reached by boat. You can hike to Darboğaz, too. As well as Fethiye beaches and bays, the town has lots of beaches in close proximity where, if you wanted to hire a car, you could go further afield for the day. Some of these beaches have other attractions, too. All of these beaches are around one hour’s drive or less. 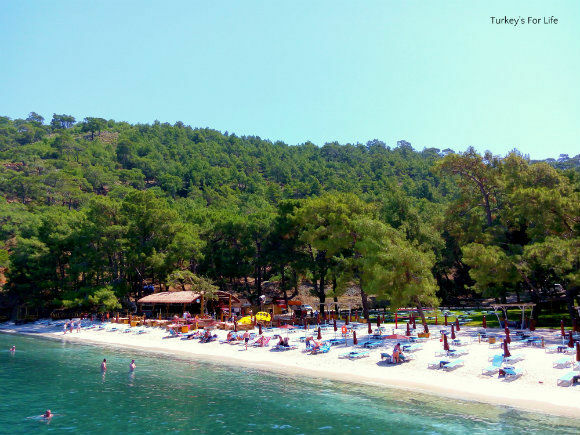 Sarıgerme is a huge stretch of sandy beach, not too far from Dalaman Airport. Very much a package holiday resort but if you’re looking for soft sand, this is a good option. A popular stop for yachts and gülets. This is a beautiful bay, accessed by road. The road is just to the left before you hit Dalaman Airport. If you want to feel like you’re in the tropics, this little ride up the Dalaman River to the beach area at Akkaya is a must. Iztuzu Beach – also known as Turtle Beach – is a stunning stretch of sand close to the town of Dalyan. 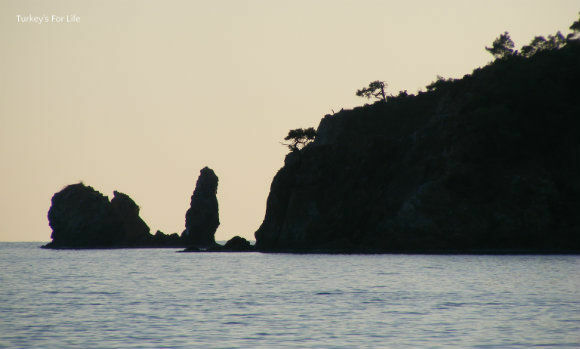 Iztuzu is a protected area as it is a major nesting area for sea turtles. As well as sunbathing spots in designated zones, there are snack bars and this is also home to the turtle rehabilitation centre and the wonderful Kaptan June. 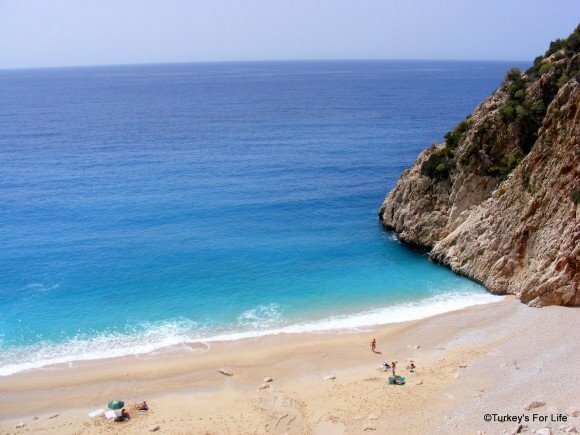 These beaches are 1-2 hours drive away from Fethiye. A true beach lover’s paradise. Development is strictly regualted here so it’s just you and the sand dunes. There’s a snack bar and beds and, as the area is protected, an entrance fee, too. 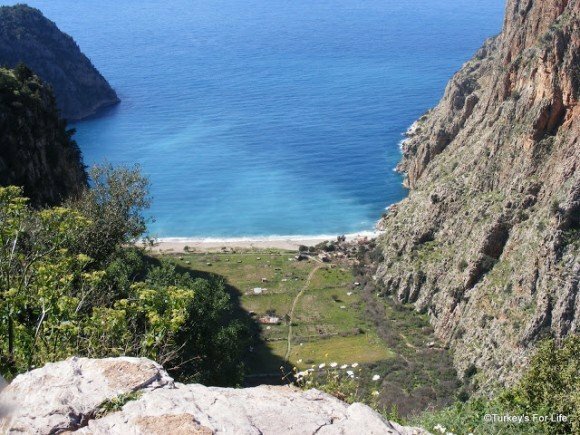 Take in Patara’s Roman and Lycian ruins before you hit the beach if that’s your thing. This is the public beach in town. An easy day trip from Fethiye and you can wander around Kalkan, too. As you can see from the photo, our stops at Kaputaş are usually in winter when all is a bit more secluded. Popular in summer, you need to park on the road at the top and climb down the steps to get your sunbathing spot. Big Pebble Beach (Büyük Çakal Plajı) is one of our favourite places in the already very pretty Kaş. A handful of snack bars here. Lots of beds and umbrellas in summer. More chilled in spring and autumn. You can take a boat from Kaş harbour to spend a few hours at this bay. And there you have it. This is not an exhaustive directory of every single nook and cranny that exists in Fethiye and beyond. Just a list of some of the popular Fethiye beaches and bays (and beyond) that you might want to consider for a day out if you’re in the area. 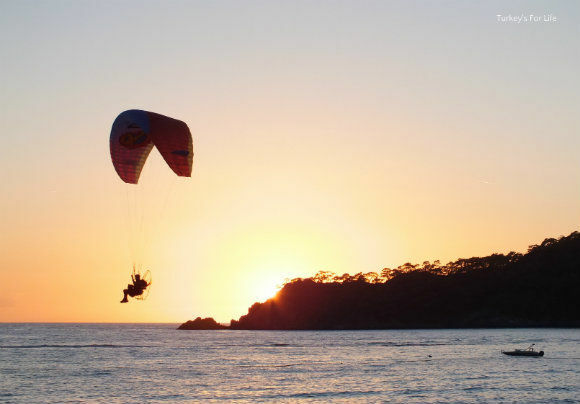 We’ll be adding links to the relevant articles for each Fethiye beach as and when we write about them. And don’t forget, you can click on the links that are already there above for photos and more detailed articles about the beaches we have already lazed around on or wandered along.